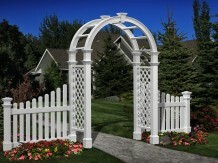 Arbors and pergolas are a beautiful addition to any yard or garden. They can be used as a trellis for graceful climbing roses, an elegant additional to your existing fenceline or a dramatic transition from one area of a yard to another. 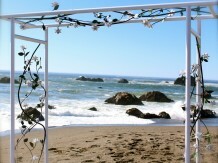 They also offer the perfect backdrop for those special events. 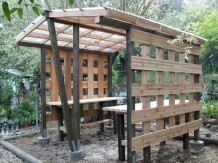 We offer arbors and pergolas made of steel, vinyl or wood. You can either choose from several pre-fabricated styles or have us custom fabricate it to suit your needs. And our custom designs are not just limited to one material, many times they can include a combination of wood, vinyl or steel. 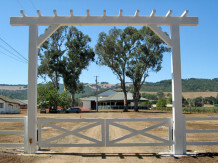 Whether it's a small garden arch, an arbor, or a large pergola you are after, we have constructed many custom styles over the past several years. Virtually maintenance free, these look brand new year after year. Vinyl arbors require no staining or painting or long term maintenance. 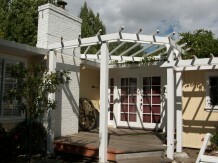 Steel arbors and pergolas are versatile structures that can be used for a multitude of different purposes. Purposes that can be both practical and whimsical. They can create a perfect trellis for a gorgeous climbing plant, a backyard screen to hide unattractive objects, a accent to a garden creating an old fashioned nostalgic look that can help create that elegant cottage look of a cottage. They can be made completely from steel or in combination with other products such as vinyl, wood and composite materials. Hand fabricated and completely customized. These garden arbors are a personal statement to compliment your garden. It can be left to rust or hand painted with detail, up to you and your imagination. Possibilities are endless.